Ohio Contract Work is Made Efficient | Grunau Company, Inc.
Several months ago, an employee at the Grunau Youngstown fire protection office received a change order for some Ohio contract work. He spent a better part of the morning going from person to person. He asked each person how to get this change order recognized by our accounting system. Eventually it was revealed that he needed to make a change order to the project’s “green sheet” (booking sheet). Another part of the morning was then spent finding a person who knew how to apply a change order to a booking sheet. Other instances of inefficiency concerning contract projects started to reveal themselves. Salespeople were using many different templates for proposals and storing them in a number of places. Notices of impact and other formal project management letters were being used inconsistently. Many in the office were even unsure as to the process of setting up new vendors. The branch manager realized this was an opportunity to combine all of these inconsistencies and inefficiencies concerning Ohio contract work into the office’s first Lean event for the year. 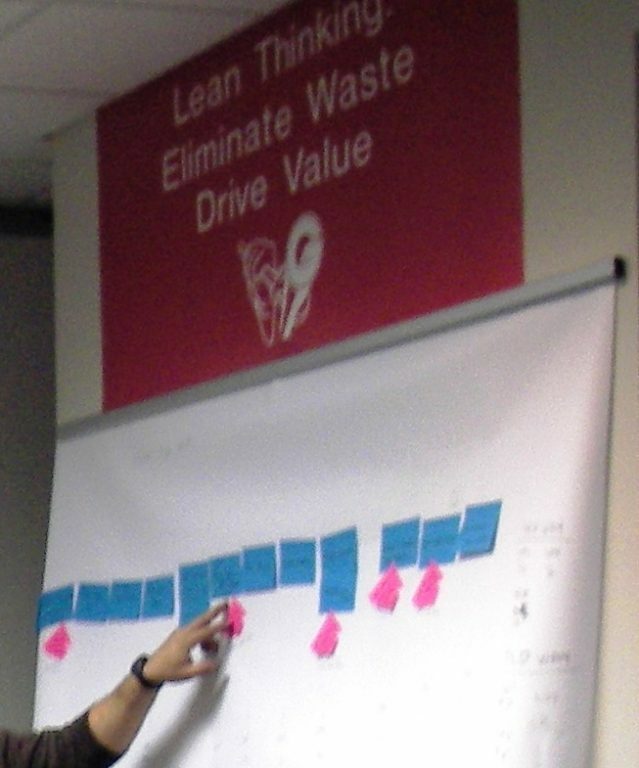 On March 24, the entire Ohio office took part in the Lean VSM (Value Stream Map) contract event. The group realized that the “process of contract work” was a broad topic with many variables. Thus the current condition on the initial VSM was long and detailed. All good VSMs start at the very beginning of any process. Therefore the first step of a contract job is when the customer calls concerning a new project. All the steps were listed through to the close-out items and final billings at the end of the job. Everything from the storage of installation drawings to documentation of change orders were discussed as the current condition VSM flowed from start to finish. After determining the current condition, the team moved on to the future state VSM. At this point, they understood this was a “hybrid” Lean event to clean up the contract job process flow. Templates were reviewed as well as examples of the many tools necessary for contract work. Templates include how to fill out a monthly billing to how to set up a new customer. Ohio’s common drive now contains templates and forms that a project manager needs to navigate through a contract job. The Lean event also inspired future initiatives including creation of a new, cleaner proposal template. Once agreed upon, this template will be the Grunau Youngstown standard for any proposal. The current prototype of this template looks great. It features a watermark and makes info easier to sort through from the customer’s perspective. The Lean VSM also showed a disconnect between where designers store documentation and project managers’ file access limitations. The office agreed there needs to be one central storage location for all of Ohio’s contract projects. Lengthy conversations occurred about how stored files should be formatted and potential pitfalls of making it too “open” for manipulation. The team is meeting again next month for a final review of the future state Ohio contract work VSM. Just like Grunau’s Lean Mission statement reads, by continuously improving our processes, we can provide greater value to our customers without waste.